The Wandering Chef is hosting a special Pop-up Operating Theatre for Grub Club's Nose To Tail season, complete with all sorts of gory treats. "In honour of London's very own Nose to Tail Week, The Wandering Chef is preparing a feast for the truest of meat lovers. Your average butchers might gratuitously hack away like the Ripper. We however have decided to surgically slice the most sumptuous morsels from nose to tail to re-Veal the best of the beast. 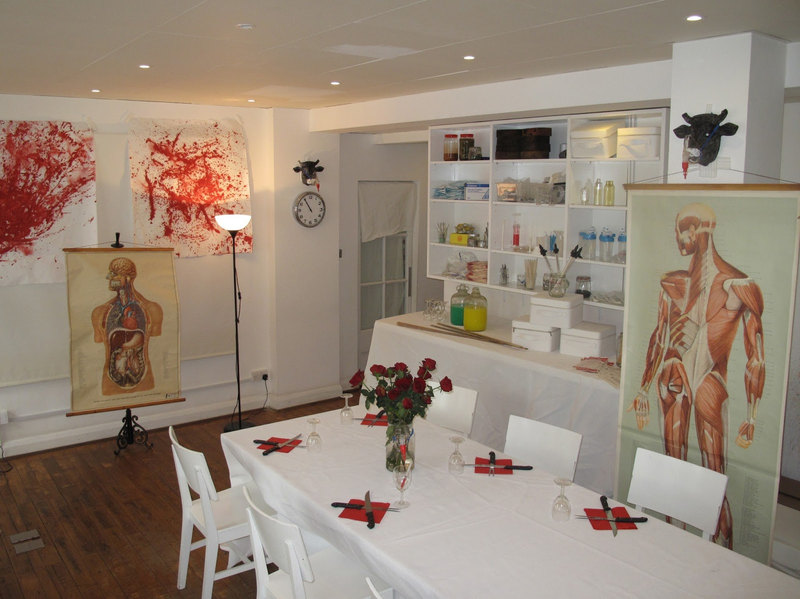 Five courses of unexpected Veal based delights will be served in our pop-up operating theatre, so bring a visceral curiosity and we'll provide the scalpel! Not only will we be providing a true taste of all the cuts many discard, we will be championing a meat that, through a lack of understanding, frequently goes to waste. As there is little demand for Veal in this country, calves that are bred as a byproduct of the dairy industry are often just slaughtered and discarded. To accompany our gory celebration of Veal, there will be a cash bar featuring our favorite medicines and bloody remedies. "